Thus far the Hashemite Kingdom of Jordan has weathered the storm that has swept across the Middle East since the beginning of the year. But the relative calm in Amman is an illusion. The unspoken truth is that the Palestinians, the country's largest ethnic group, have developed a profound hatred of the regime and view the Hashemites as occupiers of eastern Palestine—intruders rather than legitimate rulers. This, in turn, makes a regime change in Jordan more likely than ever. Such a change, however, would not only be confined to the toppling of yet another Arab despot but would also open the door to the only viable peace solution—and one that has effectively existed for quite some time: a Palestinian state in Jordan. The majority Palestinian population of Jordan bridles at the advantages and benefits bestowed on the minority Bedouins. Advancement in the civil service, as well as in the military, is almost entirely a Bedouin prerogative with the added insult that Palestinians pay the lion's share of the country's taxes. Despite having held a comprehensive national census in 2004, the Jordanian government would not divulge the exact percentage of Palestinians in the kingdom. Nonetheless, the secret that everyone seems to know but which is never openly admitted is that Palestinians make up the vast majority of the population. In his 2011 book, Our Last Best Chance, King Abdullah claimed that the Palestinians make up a mere 43 percent. The U.S. State Department estimates that Palestinians make up "more than half" of Jordanians while in a 2007 report, written in cooperation with several Jordanian government bodies, the London-based Oxford Business Group stated that at least two thirds of Jordan's population were of Palestinian origin. Palestinians make up the majority of the population of Jordan's two largest cities, Amman and Zarqa, which were small, rural towns before the influx of Palestinians arrived in 1967 after Jordan's defeat in the Six-Day War. In most countries with a record of human rights violations, vulnerable minorities are the typical victims. This has not been the case in Jordan where a Palestinian majority has been discriminated against by the ruling Hashemite dynasty, propped up by a minority Bedouin population, from the moment it occupied Judea and Samaria during the 1948 war (these territories were annexed to Jordan in April 1950 to become the kingdom's West Bank). As a result, the Palestinians of Jordan find themselves discriminated against in government and legislative positions as the number of Palestinian government ministers and parliamentarians decreases; there is not a single Palestinian serving as governor of any of Jordan's twelve governorships. Jordanian Palestinians are encumbered with tariffs of up to 200 percent for an average family sedan, a fixed 16-percent sales tax, a high corporate tax, and an inescapable income tax. Most of their Bedouin fellow citizens, meanwhile, do not have to worry about most of these duties as they are servicemen or public servants who get a free pass. Servicemen or public employees even have their own government-subsidized stores, which sell food items and household goods at lower prices than what others have to pay, and the Military Consumer Corporation, which is a massive retailer restricted to Jordanian servicemen, has not increased prices despite inflation. Decades of such practices have left the Palestinians in Jordan with no political representation, no access to power, no competitive education, and restrictions in the only field in which they can excel: business. According to the Minority Rights Group International's World Directory of Minorities and Indigenous Peoples of 2008, "Jordan still considers them [Palestinian-Jordanians] refugees with a right of return to Palestine." This by itself is confusing enough for the Palestinian majority and possibly gives basis for state-sponsored discrimination against them; indeed, since 2008, the Jordanian government has adopted a policy of stripping some Palestinians of their citizenship. Thousands of families have borne the brunt of this action with tens of thousands more potentially affected. The Jordanian government has officially justified its position: Deputy Prime Minister and Minister of the Interior Nayef Qadi told the London-based al-Hayat newspaper that "Jordan should be thanked for standing up against Israeli ambitions of unloading the Palestinian land of its people" which he described as "the secret Israeli aim to impose a solution of Palestinian refugees at the expense of Jordan." According to a February 2010 Human Rights Watch (HRW) report, some 2,700 Jordanian-Palestinians have had their citizenship revoked. As HRW obtained the figure from the Jordanian government, it is safe to assume that the actual figure is higher. To use the words of Sarah Leah Whitson, executive director of the Middle East and North Africa division of HRW, "Jordan is playing politics with the basic rights of thousands of its citizens." But Abdullah does not really want the Palestinians out of his kingdom. For it is the Palestinians who drive the country's economy: They pay heavy taxes; they receive close to zero state benefits; they are almost completely shut out of government jobs, and they have very little, if any, political representation. He is merely using them as pawns in his game against Israel by threatening to make Jerusalem responsible for Jordanians of Palestinian descent in the name of the "right of return." Despite systematic marginalization, Palestinians in Jordan seem well-settled and, indeed, do call Jordan home. Hundreds of thousands hold "yellow cards" and "green cards," residency permits allowing them to live and work in Israel while they maintain their Jordanian citizenship. In addition, tens of thousands of Palestinians—some even claim hundreds of thousands—hold Israeli residency permits, which allow them to live in Judea and Samaria. Many also hold a "Jerusalem Residency Card," which entitles them to state benefits from Israel. Yet they have remained in Jordan. Despite ill treatment by the Jordanian government, they still wish to live where most of their relatives and family members live and perhaps actually consider Jordan home. The Hashemites' discriminatory policies against the Palestinians have been overlooked by the West, Washington in particular, for one main reason: the Palestine Liberation Organization (PLO) was the beating heart of Palestinian politics, and thus, if the Palestinians were empowered, they might topple the Hashemites and transform Jordan into a springboard for terror attacks against Israel. This fear was not all that farfetched. The Palestinian National Charter, by which the PLO lives, considers Palestine with its original mandate borders (i.e., including the territory east of the Jordan River, or Transjordan) as the indivisible homeland of the Palestinian Arab people. In the candid admission of Abu Dawoud, Yasser Arafat's strongman in the 1970s, "Abu Ammar [Arafat] was doing everything then to establish his power and authority in Jordan despite his public statements" in support of King Hussein. This tension led to the 1970 Black September civil war where the PLO was expelled from Jordan and thousands of Palestinians were slaughtered by Hussein's Bedouin army. With the threat of Palestinian militants removed, the idea of having the Muslim Brotherhood entrenched in a Palestinian state with the longest border with Israel would naturally be of concern to Israel and its allies. The only problem with this theory is that the Muslim Brotherhood in Jordan is dominated by Bedouins, not Palestinians. The prominent, hawkish Muslim Brotherhood figure, Zaki Bani Rushiad, for example, is a native of Irbid in northern Jordan—not a Palestinian. Salem Falahat, another outspoken Brotherhood leader, and Abdul Latif Arabiat, a major tribal figure and godfather of the Brotherhood in Jordan, are also non-Palestinians. Upon President Obama's announcement of the death of Osama bin Laden, tribal Jordanians in the southern city of Ma'an mourned the terror leader's death and announced "a celebration of martyrdom." Other cities with predominantly Bedouin populations, such as Salt and Kerak, did the same. The latter, a stronghold of the Majali tribe (which has historically held prominent positions in the Hashemite state) produced Abu Qutaibah al-Majali, bin Laden's personal aide between 1986 and 1991, who recruited fellow Bedouin-Jordanian, Abu Musab al-Zarqawi, head of al-Qaeda in Iraq who was killed in a 2006 U.S. raid. The Hashemite regime is keenly aware of U.S. and Israeli fears and has, therefore, striven to create a situation where the world would have to choose between the Hashemites and the Muslim Brotherhood as Jordan's rulers. To this end, it has supported the Muslim Brotherhood for decades, allowing it to operate freely, to run charitable organizations and youth movements, and to recruit members in Jordan. In 2008, the Jordanian government introduced a new law, retroactively banning any existing political party unless it had five hundred members and branches in five governorates (counties). Since such conditions could only be fulfilled by the Muslim Brotherhood, most political parties were dissolved de jure because they did not meet the new standards, leaving the Islamic Action Front as the strongest party in the kingdom. Both Jerusalem and Washington are aware of the Jordanian status quo yet have chosen to accept the Hashemite regime as it is, seduced by the conventional wisdom of "the devil you know is better than the devil you don't." The facts on the ground, however, suggest that the devil they think they know is in deep trouble with its own supposed constituency. Despite their lavish privileges, Jordanian Bedouins seem to insist relentlessly on a bigger piece of the cake, demanding more privileges from the king, and, in doing so, they have grown fearless about defying him. Since 2009, fully-armed tribal fights have become commonplace in Jordan. Increasingly, the Hashemite regime has less control than it would like over its only ruling foundation—the Bedouin minority—which makes up the army, the police forces, all the security agencies, and the Jordanian General Intelligence Department. The regime is, therefore, less likely to survive any serious confrontations with them and has no other choice but to keep kowtowing to their demands. What complicates the situation even further is that Bedouin tribes in Jordan do not maintain alliances only with the Hashemites; most shift their loyalties according to their current interests and the political season. Northern tribes, for example, have exhibited loyalty to the Syrian regime, and many of their members hold dual citizenships. In September 1970, when Syrian forces invaded Jordan in the midst of the civil war there, the tribes of the northern city of Ramtha raised the Syrian flag and declared themselves "independent" from the Hashemite rulers. Likewise, Bedouin tribes of the south have habitually traded loyalty for privileges and handouts with whoever paid better, beginning with the Turks, then replacing them with the better-paying Britons, and finally the Hashemites. This pattern has expanded in the last twenty years, as tribesmen exchanged their loyalties for cash; in fact this is how they got involved in the British-supported Arab revolt of World War I, in which the Bedouins demanded to be paid in gold in advance in order to participate in the fighting against the Ottomans despite their alignment with the Ottoman Empire before joining the revolt. This in turn means that the Jordanian regime is now detested not only by the Palestinians but also by the Bedouins, who have called for a constitutional monarchy in which the king hands his powers to them. Should the tribes fail to achieve their goals, they will most likely expand their demonstrations of unrest—complete with tribal killings, blockades, armed fights, robberies, and attacks on police officers—which the Jordanian state finds itself having to confront weekly. In 2010, an average of five citizens was killed each week just as a result of tribal unrest. The Hashemite regime cannot afford to confront the tribesmen since they constitute the regime's own servicemen and intelligence officers. In 2002, the Jordanian army besieged the southern Bedouin city of Ma'an in order to arrest a group of extremists, who were then pardoned a few years later. Similarly, Hammam Balaoui, a Jordanian intelligence double agent was arrested in 2006 for supporting al-Qaeda, only to be released shortly thereafter, eventually blowing himself up in Afghanistan in 2009 along with seven senior CIA officers and King Abdullah's cousin. These open displays of animosity are of a piece with the Hashemite regime's use of its Palestinian citizens as pawns in its game of anti-Israel one-upmanship. King Hussein—unlike his peace-loving image—made peace with Israel only because he could no longer afford to go to war against it. His son has been less shy about his hostility and is not reluctant to bloody Israel in a cost-effective manner. For example, on August 3, 2004, he went on al-Arabiya television and slandered the Palestinian Authority for "its willingness to give up more Palestinian land in exchange for peace with Israel." He often unilaterally upped Palestinian demands on their behalf whenever the Palestinian Authority was about to make a concession, going as far as to threaten Israel with a war "unless all settlement activities cease." This hostility toward Israel was also evident when, in 2008, Abdullah started revoking the citizenship of Jordanian Palestinians. By turning the Palestinian majority in Jordan into "stateless refugees" and aggressively pushing the so-called "right of return," the king hopes to strengthen his anti-Israel credentials with the increasingly Islamist Bedouins and to embarrass Jerusalem on the world stage. It is not inconceivable to envision a scenario where thousands of disenfranchised Palestinians find themselves stranded at the Israeli border, unable to enter or remain in Jordan. The international media—no friend of the Jewish state—would immediately jump into action, demonizing Israel and turning the scene into a fiasco meant to burden Jerusalem's conscience—and that of the West. The Hashemite regime would thereby come out triumphant, turning its own problem—being rejected and hated by the Palestinians—into Israel's problem. The Jordanian government's mistreatment of its Palestinian citizenry has taken a significant toll. Today, the Palestinians are a ticking bomb waiting to explode, especially as they watch their fellow Arabs rebelling against autocrats such as Egypt's Mubarak, Libya's Qaddafi, or Syria's Assad. The complex relationship between the Palestinian majority and the Hashemite minority seems to have become tenser since Abdullah ascended the throne in 1999 after King Hussein's death. Abdullah's thin knowledge of the Arabic language, the region, and internal affairs, made him dependent on the Bedouin-dominated Jordanian Intelligence Department standing firmly between the king and his people, of which the Palestinians are the majority. A U.S. embassy cable, dated July 2009, reported "bullying" practiced by the fans of al-Faisali Soccer Club (predominantly Bedouin Jordanians) against the fans of al-Wihdat Soccer Club (predominantly Palestinians), with al-Faisali fans chanting anti-Palestinian slogans and going so far as to insult Queen Rania, who is of Palestinian descent. Two days after the cable was released, Jordanian police mercilessly attacked Palestinian soccer fans without provocation, right under the eyes of the international media. Palestinians in Jordan have also developed an intense hatred of the military as they are not allowed to join the army; they see Bedouin servicemen getting advantages in state education and health care, home taxes, and even tariff exemption on luxury vehicles. 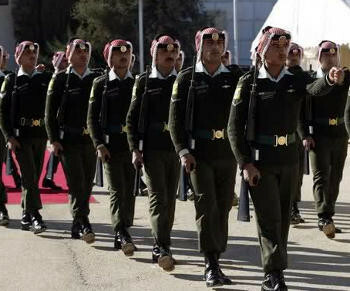 In recent years, the Jordanian military has consumed up to 20.2 percent of the country's gross domestic product (GDP). Government spending does not end with the army. Jordan has one of the largest security and intelligence apparatuses in the Middle East, perhaps the largest compared to the size of its population. Since intelligence and security officers are labeled as "military servicemen" by the Jordanian Ministry of Finance, and their expense is considered military expenditure, Jordanian Palestinians see their tax dollars going to support job creation for posts from which they themselves are banned. At the same time, the country has not engaged in any warfare since 1970, leading some to conclude that this military spending is designed to protect the regime and not the country—a conclusion underscored by the Black September events. The desperate and destabilizing measures undertaken by the Hashemite regime to maintain its hold on power point to a need to revive the long-ignored solution to the Arab-Israeli conflict: the Jordanian option. With Jordan home to the largest percentage of Palestinians in the world, it is a more logical location for establishing Palestinian statehood than on another country's soil, i.e., Israel's. There is, in fact, almost nothing un-Palestinian about Jordan except for the royal family. Despite decades of official imposition of a Bedouin image on the country, and even Bedouin accents on state television, the Palestinian identity is still the most dominant—to the point where the Jordanian capital, Amman, is the largest and most populated, Palestinian city anywhere. Palestinians view it as a symbol of their economic success and ability to excel. Moreover, empowering a Palestinian statehood for Jordan has a well-founded and legally accepted grounding: The minute the minimum level of democracy is applied to Jordan, the Palestinian majority would, by right, take over the political momentum. For decades, however, regional players have entertained fears about empowering the Palestinians of Jordan. While there may be apprehension that Jordan as a Palestinian state would be hostile to Israel and would support terror attacks across their long border, such concerns, while legitimate, are puzzling. Israel has allowed the Palestinians to establish their own ruling entities as well as their own police and paramilitary forces on soil captured in the 1967 war, cheek by jowl with major Israeli population centers. Would a Palestinian state on the other side of the Jordan River pose any greater security threat to Israel than one in Judea and Samaria? Moreover, the Jordan Valley serves as a much more effective, natural barrier between Jordan and Israel than any fences or walls. Israeli prime minister Benjamin Netanyahu confirmed the centrality of Israeli control over the western side of the Jordan Valley, which he said would never be relinquished. It is likely that the area's tough terrain together with Israel's military prowess have prevented the Hashemite regime from even considering war with Israel for more than forty years. It could be argued that should the Palestinians control Jordan, they would downsize the military institutions, which are dominated by their Bedouin rivals. A Palestinian-ruled Amman might also seek to cut back on the current scale of military expenditures in the hope that the U.S. military presence in the region would protect the country from unwelcome encroachments by Damascus or Tehran. It could also greatly benefit from financial and economic incentives attending good-neighbor relations with Israel. Even if a Jordanian army under Palestinian commanders were to be kept at its current level, it would still be well below Israel's military and technological edge. After all, it is Israel's military superiority, rather than regional goodwill, that drove some Arab states to make peace with it. The Palestinians in Jordan already depend on Israel for water and have enjoyed a thriving economic boom driven by the "Qualified Industrial Zones," which allow for Jordanian clothing factories to export apparel to the United States at preferred tariff rates if a minimum percentage of the raw material comes from Israel. Hundreds of Palestinian factory owners have prospered because of these zones. Expanding such cooperation between a future Palestinian state in Jordan and Israel would give the Palestinians even more reasons to maintain a good relationship with their neighbor. Both the United States and Israel should consider reevaluating the Jordan option. Given the unpopularity of the Hashemite regime among its subjects, regime change in Amman should not be that difficult to achieve though active external intervention would likely yield better results than the wait-and-see-who-comes-to-power approach followed during the Egyptian revolution. After twelve years on the throne, and $7 billion dollars in U.S. aid, Abdullah is still running a leaky ship and creating obstacles to resolving the Palestinian issue. Washington's leverage can come into play as well with the Jordanian armed forces which are, in theory, loyal to the king. With hundreds of troops undergoing training in the United States each year and almost $350 million handed out in military aid, the U.S. establishment could potentially influence their choices. Recent events in the Middle East should serve as guidelines for what ought to be pursued and avoided. U.S. diplomacy failed to nurse a moderate opposition to Egypt's Mubarak, which could have blocked Islamists and anti-Americans from coming to power. The current turmoil in Libya has shown that the later the international community acts, the more complicated the situation can get. An intervention in Jordan could be much softer than in Libya and with no need for major action. Abdullah is an outsider ruling a poor country with few resources; his only "backbone" is Washington's political and financial support. In exchange for a promise of immunity, the king could be convinced to let the Palestinian majority rule and become a figurehead, like Britain's Queen Elizabeth. As further assurance of a future Palestinian Jordan's peaceful intentions, very strict antiterrorism laws must be implemented, barring anyone who has incited violence from running for office, thus ruling out the Islamists even before they had a chance to start. Such an act should be rewarded with economic aid that actually filters down to the average Jordanian as opposed to the current situation, in which U.S. aid money seems to support mainly the Hashemites' lavish lifestyle. Alongside downsizing the military, a defense agreement with Washington could be put in place to help protect the country against potentially hostile neighbors. Those who argue that Jordan needs a strong military to counter threats from abroad need only look again at its history: In 1970, when Syria invaded northern Jordan, King Hussein asked for U.S. and Israeli protection and was eventually saved by the Israeli air force, which managed to scare the Syrian troops back across the border. Again in 2003, when Washington toppled Saddam Hussein, Amman asked for U.S.-operated Patriot missile batteries and currently favors an extended U.S. presence in Iraq as a Jordanian security need. Should the international community see an advantage to maintaining the military power of the new Palestinian state in Jordan as it is today, the inviolability of the peace treaty with Israel must be reasserted, indeed upgraded, extending into more practical and tangible economic and political arenas. A mutual defense and counterterrorism agreement with Israel should be struck, based on one simple concept—"good fences make good neighbors"—with the river Jordan as the fence. Considering the Palestinian-Jordanian option for peace would not pose any discrimination against Palestinians living in the West Bank, nor would it compromise their human rights: They would be welcome to move to Jordan or stay where they are if they so wished. Free will should be the determinant, not political pressure. Besides, there are indications that many would not mind living in Jordan. Were the Palestinians to dominate Jordan, this tendency will be significantly strengthened. This possibility has also recently been confirmed by a released cable from the U.S. embassy in Amman in which Palestinian political and community representatives in Jordan made clear that they would not consider the "right of return" should they secure their civil rights in Jordan. Empowering Palestinian control of Jordan and giving Palestinians all over the world a place they can call home could not only defuse the population and demographic problem for Palestinians in Judea and Samaria but would also solve the much more complicated issue of the "right of return" for Palestinians in other Arab countries. Approximately a million Palestinian refugees and their descendents live in Syria and Lebanon, with another 300,000 in Jordan whom the Hashemite government still refuses to accept as citizens. How much better could their future look if there were a welcoming Palestinian Jordan? The Jordanian option seems the best possible and most viable solution to date. Decades of peace talks and billions of dollars invested by the international community have only brought more pain and suffering for both Palestinians and Israelis—alongside prosperity and wealth for the Hashemites and their cronies. It is time for the international community to adopt a more logical and less costly solution rather than to persist in long discredited misconceptions. It is historically perplexing that the world should be reluctant to ask the Hashemites to leave Jordan, a country to which they are alien, while at the same time demanding that Israeli families be removed by force from decades-old communities in their ancestral homeland. Equally frustrating is the world's silence while Palestinians seeking refuge from fighting in Iraq are locked in desert camps in eastern Jordan because the regime refuses to settle them "unless foreign aid is provided." The question that needs to be answered at this point is: Has the West ever attempted to establish any contacts with a pro-peace, Palestinian-Jordanian opposition? Palestinians today yearn for leaders. Washington is presented with a historical opportunity to support a potential Palestinian leadership that believes in a peace-based, two-state solution with the River Jordan as the separating border between the two countries. Such leadership does seem to exist. Last September, for example, local leaders in Jordanian refugee camps stopped Palestinian youth from participating in mass protests against the Israeli Embassy in Amman; as a result, barely 200 protesters showed up instead of thousands as in similar, previous protests. As for East Jerusalem, under Israel's 44-year rule, Muslims, Christians, and members of all other religions have been able to visit and practice their faith freely, just as billions of people from all over the world visit the Vatican or Muslim pilgrims flock to Mecca. Yet under the Hashemite occupation of the city, this was not done. Without claiming citizenship, Jerusalem would remain an open city to all who come to visit. The Jordanian option is an overdue solution: A moderate, peaceful, economically thriving, Palestinian home in Jordan would allow both Israelis and Palestinians to see a true and lasting peace. Mudar Zahran is a Jordanian-Palestinian writer who resides in the United Kingdom as a political refugee. He served as an economic specialist and assistant to the policy coordinator at the U.S. Embassy in Amman before moving to the U.K. in 2010. "Jordan: Country Reports on Human Rights Practices, 2001," Bureau of Democracy, Human Rights, and Labor, U.S. Department of State, Mar. 4, 2002. "The Report: Emerging Jordan 2007," Oxford Business Group, London, Apr. 2007. "Jordan: Country Reports on Human Rights Practices, 2001," Mar. 4, 2002. "Brief History," Civil Service Consumer Corporation, Government of Jordan, Amman, 2006. Jordan News Agency (PETRA, Amman), Jan. 10, 2011. "Jordan: Palestinians," World Directory of Minorities and Indigenous Peoples, Minority Rights Group International, 2008, accessed Sept. 20, 2011. "Stateless Again," Human Rights Watch, New York, Feb. 1, 2010. The Arab Times (Kuwait City), Jan. 13, 2011. "Jordan: Stop Withdrawing Nationality from Palestinian-Origin Citizens," Human Rights Watch, Washington, D.C., Feb. 1, 2010. "Jordan: Information on the right of abode of a Palestinian from the West Bank who holds a Jordanian passport which is valid for five years," Immigration and Refugee Board of Canada, Oct. 1, 1993, JOR15463.FE. "Jordan's treatment of failed refugee claimants," Immigration and Refugee Board of Canada, Mar. 9, 2004, JOR42458.E. The Palestinian National Charter, Resolutions of the Palestine National Council, July 1-17, 1968. Al-Jazeera (Riyadh), Oct. 1, 2005. Amman News, May 2, 2011. Awni Jadu al-Ubaydi, Jama'at al-Ikhwan al-Muslimin fi al-Urdunn wa-Filastin, 1945-1970 (Amman: Safahat Ta'arikhiyya, 1991), pp. 38-41. Samer Libdeh, "The Hashemite Kingdom of Apartheid?" The Jerusalem Post, Apr. 26, 2010. Michael Korda, Hero: The Life and Legend of Lawrence of Arabia (New York: Harper, 2010), p. 19. Hürriyet (Istanbul), Mar. 4, 2011. Libdeh, "The Hashemite Kingdom of Apartheid?" "Profile: Jordanian Triple Agent Who Killed CIA Agents," The Telegraph (London), Jan. 2010. Al-Arabiya TV (Dubai), Aug. 3, 2004. The Jerusalem Post, Sept. 24, 2010. Los Angeles Times, Oct. 1, 2006. The Guardian (London), Dec. 6, 2010. Qudosi Chronicles (Long Beach, Calif.), Dec. 16, 2010. "Assessment for Palestinians in Jordan," Minorities at Risk, Center for International Development and Conflict Management, University of Maryland, College Park, Md., Dec. 31, 2006. "Jordan Military Expenditures—Percent of GDP," CIA World Factbook, May 16, 2008. Ha'aretz (Tel Aviv), Mar. 2, 2010. Lilach Grunfeld, "Jordan River Dispute," The Inventory of Conflict and Environment Case Studies, American University, Washington, D.C., Spring 1997. Mary Jane Bolle, Alfred B. Prados, and Jeremy M. Sharp, "Qualifying Industrial Zones in Jordan and Egypt," Congressional Research Service, Washington, D.C., July 5, 2006. Mitchell Bard, "Modern Jordan," Jewish Virtual Library, accessed Aug. 11, 2011. The Christian Science Monitor (Boston), Jan. 30, 2003. The Forward (New York), Apr. 13, 2007. "The Right of Return: What It Means in Jordan," U.S. Embassy, Amman, to Bureau of Near Eastern Affairs, U.S. Department of State, Washington, D.C., Feb. 6, 2008. "Non-Iraqi Refugees from Iraq in Jordan," Office of the United Nations High Commissioner for Refugees, Feb. 20, 2007. Mudar Zahran, "A Plan B for Jordan?" Hudson Institute, Washington, D.C., Sept. 16, 2011. The Washington Post, Sept. 15, 2011. Related Topics: Jordan, Palestinians | Mudar Zahran | Winter 2012 MEQ receive the latest by email: subscribe to the free mef mailing list This text may be reposted or forwarded so long as it is presented as an integral whole with complete and accurate information provided about its author, date, place of publication, and original URL.